This par 72 beauty plays more than 7,000 yards from the black tees. But Prestwick has six sets of tees to fit every golfer’s game. 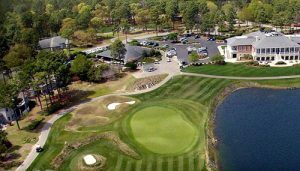 Place Description: Discover why Prestwick one of the top five best-kept secrets in Myrtle Beach. We decided to we wanted to play the day were arrive in Myrtle Beach so thanks for recommending Preswick it was so close to the airport it gave us enough time to get a round in that day and group really enjoyed the course. Fairways are nice and wide and in impeccable shape. Beautiful true reading greens. Playing from the 2nd from back tees makes many of the par 4s difficult even with a good drive. Plenty of water on the course. The greens are really fast. This year we played one tee up, green, and it was an great day. The difference is having a 6,7, or 8 iron in vs a 3 wood. Everyone in our group of 9 wants to play here again next year! Two very nice golf courses. We played preswick first it is so close to the airport that was so convenient when arriving from the airport.